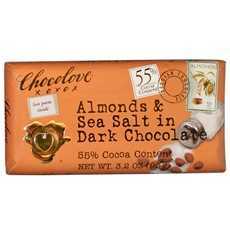 Enjoy Chocolove Almonds & Sea Salt In Dark Chocolate . Dark Semisweet Chocolate, Whole Dry Roasted Almonds And Sea Salt. At First Bite, Crunchy Almonds Release Their Flavor In A Swirl With Chocolate. The Sea Salt Crystals Continually Reset Your Sweet Taste Buds And Make A Tantalizing Taste Combination That Keeps You Wanting More. (Note: Description is informational only. Please refer to ingredients label on product prior to use and address any health questions to your Health Professional prior to use.